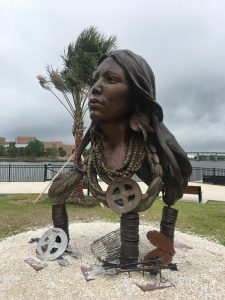 Tampa, a representative of which called it “clutter,” moved in the dark of the night on Tuesday to rip out an 1,100 pound statue intended to honor the Native Americans of Florida. 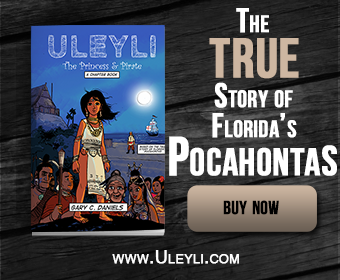 The artwork was a bust of Ulele, the daughter of the Tocobaga chief Hirrihigua. She is credited with saving the life of a young Spaniard named Juan Ortiz who came to Florida with the expedition of Pinfilo de Narvaez in 1527. The gigantic bronze bust portrays Ulele and was placed by Richard Gonzmart, the owner of the Ulele Restaurant. It was a few yards away from the Tampa Riverwalk, but not far enough away to satisfy the city. According to Gonzmart, the removal was ordered by the city’s mayor, Bob Buckhorn. The mayor denies that, but one thing is clear: city crews arrived in the middle of the night and ripped out the artwork with a large crane.